Quite simply - The best caravan airconditioner for your needs will very much depend on the ambient temperatures you will be exposed to. If your air conditioner cannot operate above or below certain temperatures - it may be useless no matter what size, type or shape Caravan, Pop Top, or RV you have. Otherwise if you are looking at buying or installing caravan airconditioning and want more information - keep reading. It will pay to view this list of Frequently Asked Questions that will help you correctly choose the best air conditioner for your setup. What's the difference between Household and a Caravan or RV Air Conditioner? Caravan air conditioners are aerodynamically designed to shelter and deflect the harsh wind and rain conditions that are intensified whilst your vehicle is in motion at 80 - 100km per hour. 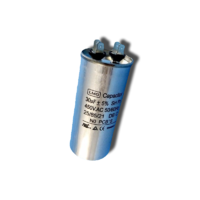 This prevents water ingress causing rust and short circuiting of the electrical components. An RV air con is engineered to withstand bumps and constant vibrations from rough road conditions eliminating the potential for cracked or leaky gas pipes and fittings and major component damage. 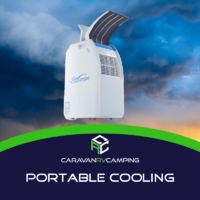 The caravan or RV air conditioner will prove to have a considerable higher life span than your typical house hold air conditioner when used in a mobile application. Space saving designs allowing a better and more practical fit to your setup. Amperage draw can be a lot lower than their house type counterparts. Easily run of most quality branded generators. Given the design requirements and rigorous testing that is applied to the caravan and RV air conditioner, you will find an elevated price in comparison to your regular household air conditioner. By far the most popular type of RV air conditioner due to its roof mounted design. This allows you to free up space inside your van as well being practical located for easily directing airflow to all areas of your caravan. Cool air will automatically sink when being distributed from a higher location. Will suit most caravan, RV, motor homes and can be purchased as an additional appliance and retro fitted. Being roof mounted means you are saving valuable storage space throughout your caravan, RV or motor home. Not being floor mounted can minimise noise giving the user a restless and quiet night's sleep. 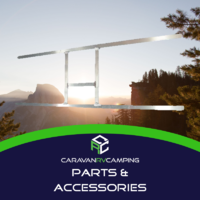 Camper vans and pop top caravans are designed to be lightweight there for not having the structural rigidity in their roof to with stand the weight of a roof top mounted air conditioner. All though adding an aluminium h-frame can spread the weight through the roof span enabling a roof top mount. Built in or under bunk air conditioners are most commonly used in pop top and camper trailer applications where the roof structure / design is not capable of withstanding the weight of a roof top mounted air conditioner. Usually mounted underneath a bed or inside a cupboard, these units can be ducted to which ever space necessary. If your application involves a camper trailer or pop top, a built in or under bunk air conditioner can be a cost-effective solution as opposed to modifying your roof to suit the extra weight of a roof top. Can take up wanted space inside of your caravan which could be used for storage. Not as effective as a split system or roof top airconditioner in a small caravan type application. Split System or built in air conditioners are most commonly used in pop top and camper trailer applications where the roof structure / design is not capable of withstanding the weight of a roof top mounted air conditioner. 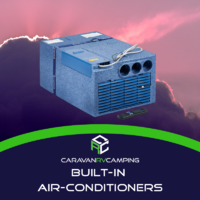 From the internal aspect of your caravan or RV, these air conditioners look like your standard box type when in fact they have a compressor remotely mounted, usually mounted with an external portal leading outside effectively making them a spilt system air conditioning unit. The box style head unit can be mounted under seating areas, up in cupboards or any other cavities that will suit their dimensions. Also, enabling the user options of ducting the units conditioned air throughout your caravan, RV, or motor home via a ducting kit. If your application involves a camper trailer or pop top caravan, a split system air conditioner can be preferable and a cost-effective solution compared to modifying or upgrading your roof to handle the extra weight of a roof top mounted air-conditioner. Can take up wanted space inside of your caravan which could be used for storage. As we all know when loading your caravan, motor home or RV, finding extra room for all your touring necessities can be quite a tactful procedure. Efficiency - Reverse cycle air conditioning uses a closed refrigerant system to transfer heat. This does not require high power heating elements consuming excessive power. Reverse cycle systems use heat exchange when cooling or heating, cooling pulls the heat from inside to outside, heating moves the outside heat to the inside. Ambient temperature - Specific ambient temperatures can have a drastic outcome on the output of your air conditioner. Before making a purchase be sure to consult the manufactures placard determining ambient temperatures. Air conditioning manufactures will be fast to point out if their systems operate at sub zero temperatures and very quiet if they do not. In some circumstances when the outside temperature nears freezing point it can be a likely event that some of the air conditioners componentry can partially freeze, therefor it can result in little to no heating which can result in an uncomfortable situation. Manufactures are always up grading their design flaws in their products to try and advance the systems operations in the sub-zero climates. Upon purchasing your next caravan, RV air conditioner be sure to check the unit's specifications are compatible to your situated or touring locations. Ambient temperatures- A caravan, RV air conditioner designed with a heating element will operate in almost every ambient temperature condition delivered. Efficiency- The power usage consumed in any sort of heating application where a heating element is involved can be costly and on the lower end of the scale for efficiency. How effective is caravan or RV air-conditioning? Provided you abide by the manufactures guide lines and specifications, caravan and RV air conditioning can be as successful as house hold air conditioning. Be sure to allow for caravan, RV, camper trailer applications without insulated roof or wall panelling as a larger air conditioning unit will be required. A general guideline is there are two main groups of air conditioners. 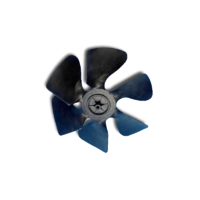 2 - 2.5 kw, suitable for vehicles up to 5 metres in length. 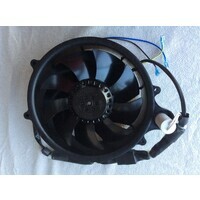 3 kw plus, suitable for vehicles up to 7 metres in length. Most manufactures will now put a vehicle length required in the specification guide lines to make it hassle free when choosing your next caravan, RV air conditioning unit. Air conditioner units are ranked by their effectiveness of cooling/heating of internal capacity in 1 hour, which is called capacity. The power that an air conditioner motor/compressor and fan require can differ to achieve the same capacity, there for its frequent to rate an air conditioners performance by its capacity and not by its power consumption. Capacity- This is generally measured in kilo watts (kw) or B.T.U (British Thermal Units). For example, a 3-kw cooling capacity air conditioner refers to the amount of actual heat removed from your room in 1 hour. The manufactures specifications should identify what size area a 3-kw rated air conditioner can effectively cool. The power required to operate the air conditioner is always a top priority especially if you propose to run off a generator. If you are camping at a caravan park where your purchase includes your power then it's not a great worry about the power being consumed. Alternatively, if your free camping and the air conditioner is being run by a generator you need to be highly aware of the air conditioners consumption. Air conditioners will demand more than the manufactures rated current draw to start operation. Continued use, the generator must be able to produce more kw than the air conditioner demands. Difference between 360mm or 400mm roof aperture? Rooftop mounted air conditioners are designed to fit either a 360mm square aperture on your roof, or a 400mm square aperture. The 400mm firstly was a European design and the 360mm was American based on their 14-inch American manufactured design roof vents. Some air conditioner models deliver and option of roof adapters to suit both apertures, this will be disclosed on the appliances information placard. What is an inverter type air conditioner? The inverter type technology integrated into air conditioners is universally known as soft start technology. This enables the technology of the invertor to run the compressor with minimal power and amp draw compared to most common air conditioner designs. Having an air conditioner that draws less amps on startup will help reduce the excess peak load put onto your generator or other power source. No matter where your travels lead you, a caravan air conditioner is usually the first priority and at the top of the caravan accessories checklist. From the well-seasoned experienced adventurer, to the "Greenie" first timer, everyone loves to take some of the comforts from their everyday lives on the road with them. Installation requirements will vary greatly depending on the type of your RV, although generally a roof top top mounted unit is the easier path to take for installation and tends to be more practical living space wise when mounted up on the roof and out of the way. 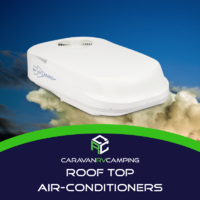 For a roof top airconditioning system, the caravan, camper trailers or poptops ability to carry the weight of the unit itself will be the main determing factor. The roof can be reinforced with an external structural H frame usually sold separately should it be required. 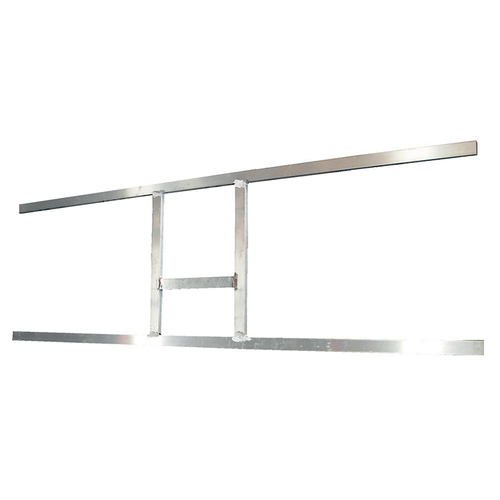 The H frame distributes the load of the air conditioner evenly throughout the roof span delivering rigidity and strength for a firm grounding for the air conditioner to be mounted on. Otherwise if a rooftop model will not suit your needs, a built in underbunk or split system type aircon will need to be considered. Installing a built in or split system unit will take up space inside your van, although sometimes it can be less expensive sacrificing some room instead of upgrading the existing roof to handle a rooftop. Underbunk units installed under the bed are a great use of space and split systems face mounts can be mounted up in cupboards and unused microwave spaces. All caravan air conditioners come equipped with a fitting, installation and owner's manual. For the best results, it is suggested that the unit be installed by a qualified tradesman and signed off by a licenced electrician. In some split system application applications, there are requirements of refrigerant gas lines to be connected which have to be carried out by a licenced air conditioner specialist. Choose from our wide range of air conditioners for your caravan, motorhome, boat, bus, truck or trailer, ranging from rooftop or under bunk air conditioners single and split systems we cater for every application of the recreational vehicle industry. Our enormous range of caravan air conditioners contain only deluxe brands ranging from Dometic, Truma and Air Command. Air Command, one of the leading brand air conditioners in the recreational vehicle market today is Australian owned and their products are designed and tested to suit the harsh elements of the Australian environment. Installing an Air command caravan air conditioner, you will receive and experience superior heating and cooling performance designed to with stand the blistering Australian climate intergrading anti vibration technology to resist the undulating road travelling of the irregular pitted Australian terrain. Air Command provide both under bunk and roof top airconditioned-applications. The Dometic Air conditioner range are affiliated with the global Dometic assortment of products and appliances for the RV industry. 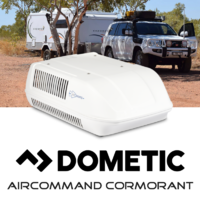 Active to their reputation of futuristic products, Dometic have delivered a recreational vehicle air conditioner built with an inverter compressor. 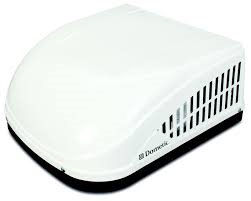 The Dometic Harrier, this soft start technology cancels out large start up current draws which most other RV air conditioners incur upon operation. You can also adjust the compressor speed to suit your heating and cooling requirements there for making it the most efficient RV air conditioner available for use in the Australian climate. Introducing the new generation Dometic Ibis Mk4 rooftop air conditioner. The Ibis Mk4 has hit the ground running with its new innovative approach to the air conditioning market. The Ibis MK4 is one out of only two RV rooftop air conditioners that features inverter technology. The benefit of the inverter technology is that it removes the initial high current draw on start up that most RV air conditioners will create, making it ideal for use with a generator or lithium battery system's. The Ibis Mk4 has an initial start-up current of less than 6.9 amps and under 1700 watts which is simply unheard of with RV roof top air conditioners. The engineers at Dometic have also implemented a variable speed compressor into the Ibis Mk 4 which provides minute noise levels even when running at high speeds or in blistering ambient temperatures, thus enabling you to enjoy uninterrupted night’s sleep or a nanny nap during the day. In addition, the inverter compressor allows the unit to ramp up or slow down in order to support the output required, therefore decreasing power draw, noise pollution and vibrations. 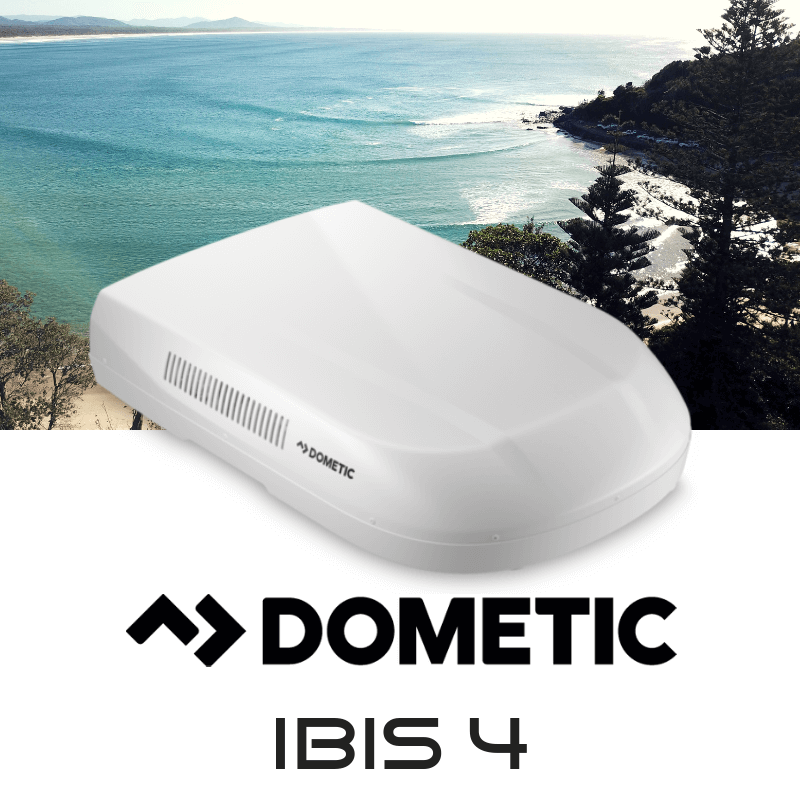 One of the best features Dometic could have added to the Ibis Mk 4 model is the inclusion of an adaption kit in order to suit roof openings of both 360mm x 360mm or 400mm x 400mm thus making it a direct replacement for almost any roof top air conditioner on the market. 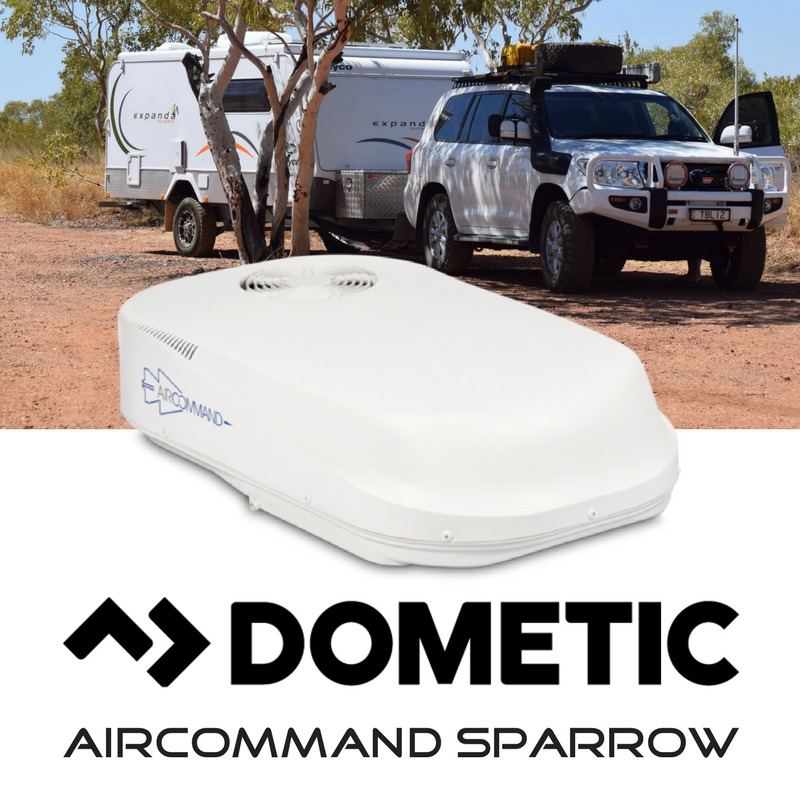 The Dometic Ibis Mk 4 has an extensive list of added features which other RV air conditioners cannot compete with including; optimised air flow for increased efficiency and reduced noise, a low profile ADB (air distribution box) which is only 48mm in height, a simplified ADB kit making for a faster and easier installation process, as well as an 8kg weight reduction compared to it’s predecessor the Ibis Mk 3 which brings its total installed weight to 40kgs, along with a low profile rooftop unit which is only 230mm in height. That is 8mm less than the Ibis Mk3! There is both a sleep mode which reduces the fan speed and compressor speed for reduced noise as well as an auto mode that will set the temperature and the system will decide the mode and fan speed. There is an ambient light sensor that automatically adjusts the brightness of the display screen and that’s just to name a few. 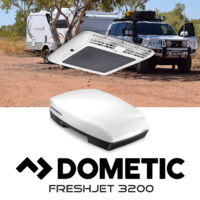 If you’re in the market for a new rooftop air conditioner for your RV, look no further than the Dometic Ibis Mk 4 with its light weight sleek profile that provides the latest technology, great pricing and can be retro fitted to almost any application. 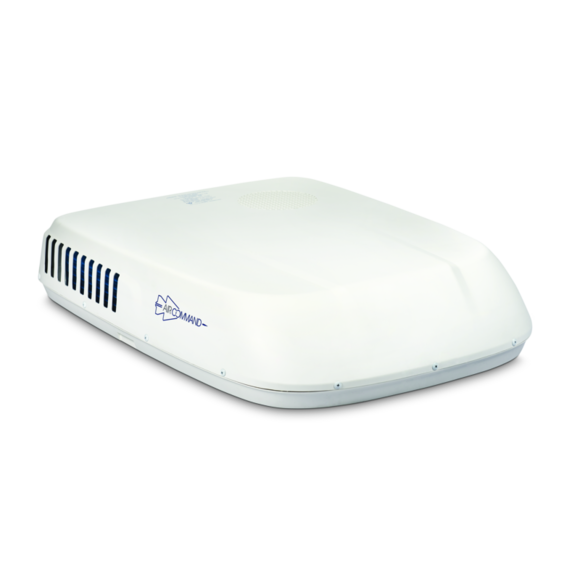 It will provide everything you want and need in an RV rooftop air conditioner plus more. The Truma Aventa roof mounted air conditioning system will cool the temperature of your caravan, motor home, bus, boat, truck or trailer to a desired degree in a very short time. The Truma Aventa will also deliver clean dehumidified conditioned air for a pleasurable internal climate even with the contrast of varying ambient temperatures. Designed and manufactured with all climate aspects in mind the Truma air conditioner can also operate as a heater using the optimised heat pump that has been incorporated into the build of this futuristic R.V air conditioning system, delivering the user the option to heat or cool weather it be in the dry hot climate of the northern parts of the Australian outback or the cooler southern terrain where every bit of warmth is a very precious commodity. From an engineering perspective the Truma air conditioning range are designed to operate at minimal noise percentages permitting the user a very quiet performance. Cool air will flow through your R.V delivered via an air distribution box (internal plenum). The unit will allow you to set a desired air flow by adjusting the four air outlets incorporated into the air distribution box. The air distributor also has an adjustable mood lighting feature integrated to the module for various internal lighting applications. The Truma comfort also allows the user to control the unit via remote control or manually on the digital C.P plus control panel. An authorised workshop can install the roof top air conditioning system in various applications whether it be a caravan, motor home, bus, boat, truck or trailer the unit is adaptable to every installation requirement. The brand new Dometic Harrier Inverter caravan airconditioner is second to none with its efficiency and power. The Harrier is the first recreational vehicle air conditioner that has inverter technology that eliminates mass current draw on start-up and everyday use. Dometic has incorporated a variable speed compressor that produces minimal noise even when at maximum speeds and temperatures. The air-conditioning system has an almighty 3.1kw cooling capacity rating making it the most forceful in its division. This particular model has an inverter compressor on board enabling the unit to slow down or speed up to sustain the output as required and in turn minimalises power draw as well as noise and vibration. 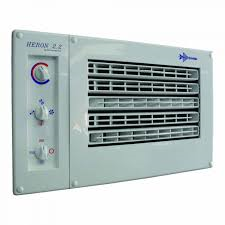 The roof top air conditioner also has added luxuries most common air conditioners cannot provide such as cold plasma air purification and remote-controlled wavering vents. The unprecedented sleep mode option also minimalizes noise and vibration levels for a whisper quiet night's sleep in addition to reducing the compressor speed. Another outstanding feature the unit carries on board is its versatility to adapt to suit cut out apertures of 360 x 360 and 400 x 400mm there for no secondary componentry or roof adapters needed. The Air Command Ibis MK 3 caravan airconditioner is Australian designed and manufactured to suit our climates and the harsh conditions the Australian terrain has to offer. 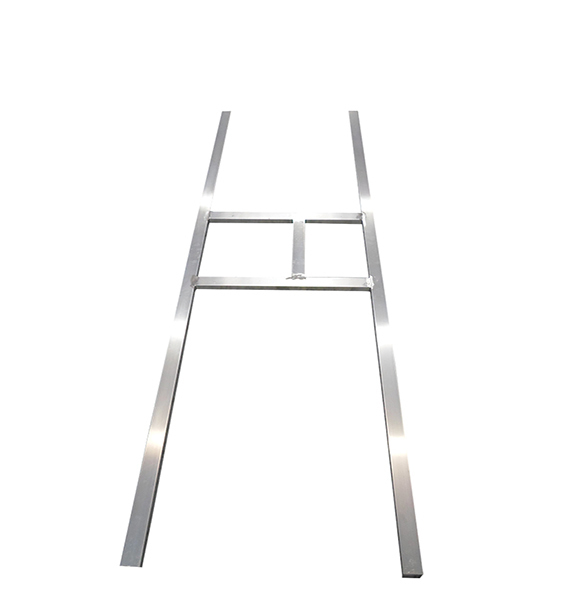 With an even sleeker minimal profile than its predecessor and increased power efficiency by more than 10% its climbing the roof top R.V air conditioner ladder in leaps and bounds. The Air Command design team have also engineered the ibis MK 3 to run at almost a non-existent noise level operating a full 8db quieter than on the previous Ibis. This low-profile design decreases drag and clearance under sheds, garages and low-lying bridges. The Ibis Mk 3 is less likely to receive damage from protruding tree limbs and other low-lying hindrances. 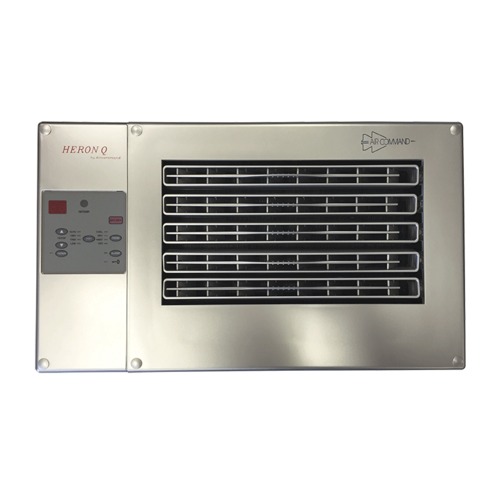 This Air Command unit delivers unrivalled efficiency both in heating and cooling modes. The Ibis has incorporated a slimline internal plenum measuring half the height of the previous model. A four-way closing internal plenum will provide a quick and easy venting system, also enabling the user easy access for removing the filters for maintenance. Delivering premium quality generator start technology, climate controlling and a dehumidifier. A multi-function option also allows a timing schedule to be set for multiple requirements. A Constantine self-adjusting adapter is complete to suit variances in roof thicknesses there for benefitting multiple installation requirements. Added luxuries to the Ibis MK 3 include a de-icing system to allow the unit to operate in extremely low ambient temperatures. The Truma Saphir Comfort is a dominant under bunk air conditioning system that cools and heats super efficiently. The biggest advantage of the Truma Saphir is being able to install the unit in confined compact storage areas there for running your ducting to a preferred location. Given the design of the storage compartment air conditioning system the Truma Saphir elevates your installation requirements enabling you to mount the unit in almost every application on caravans, motor homes, buses, boats, trucks, and even trailers. Operating in cooling mode the system will dehumidify and clean the air with its particle and fluff filters producing the freshest, cleanest conditioned air possible. Also given you can operate the Saphir on heat mode, it produces an output of 1700w of heating creating a satisfying warmth for the adventurous tourer in those cooler months of the year. The storage compartment conditioner can be calibrated via remote control or adjusted through an additional Inet ready control panel, (to be purchased separately). The compact reverse cycle air conditioner has incorporated multiple advantages such as a system that dehumidifies and cleans the air ideally for allergy sufferers, four operating modes, air circulation, cooling, heating, and automatic also endeavouring to take the top rank as the smallest air conditioning system in its class. The Aircommand Sparrow reverse cycle air conditioner has had an overhaul now delivering a system that weighs in at only 29 kg making it the lightest roof top air conditioner in its class. 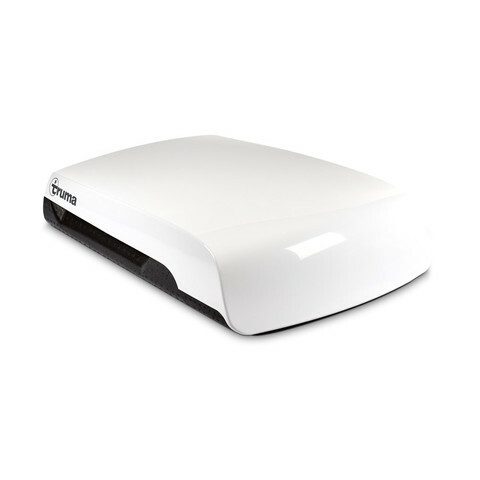 The Sparrow is ideally suitable for pop-top caravans, camper trailers and all applications where weight is a factor when installing a roof top air conditioner. The updated unit will provide 2kw of cooling and a toasty 2.2kw of heating, the MK4 also features aircommands defrost function allowing the Sparrow to operate in temperatures as low as - 5 degrees. The extremely lightweight system has incorporated multiple modern features such as a flip down adjustable climate control panel, a remote control with dehumidifying and sleep mode functionalities plus a low profile sleek design. The new profile has been manufactured not only for aesthetics, but for an everlasting roof top exterior built from a UV and impenetrable polypropylene external housing. Installation requirements have also been a high factor in the build of the MK4 delivering a weather collar as standard for a water tight install. 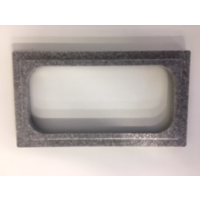 The weather collar lessens the amount of silicone involved when mounting the air conditioner and acts as a template when lowering the unit into place. 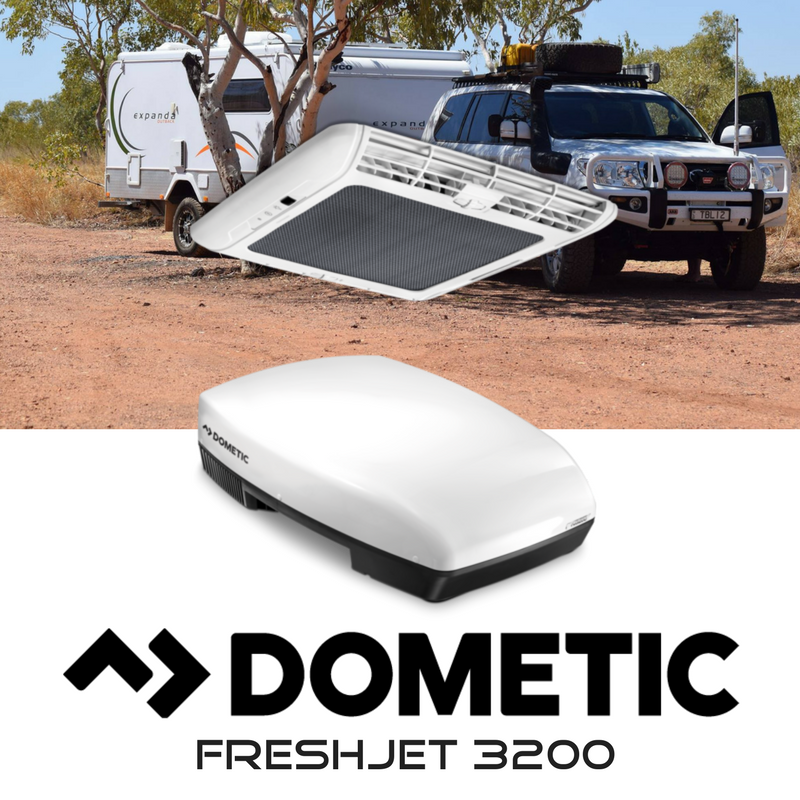 The Dometic Freshjet 3200 is ranked as one of the most compact roof top units on the market. 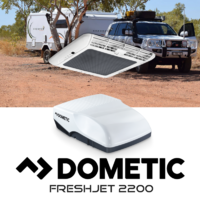 Dometics top of the range freshjet 3200 has the ability to air condition internal vehicle masses up to 8 metres plus. Manufactured with a heat pump on board the system can also deliver heating for those cooler evenings or those chilled mornings. The air conditioner being compatible in almost every installation application is comparatively lightweight and has a soft start function to enable a quiet and power efficient operation. The freshjet range covers all variances when being matched to different vehicle lengths although still delivering the same ultra-compact design throughout their range. 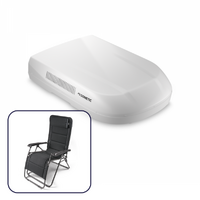 The sleek compact design still allows you to have plenty of room on your roof for other componentry such as roof hatches, aerials or even a satellite dish. Providing a very low current draw and soft start function, the air conditioning system will run quietly and economically when parked next to other campers in camp sites as we've all had that next-door camper who sounds like they have a jack hammer on their roof running all night long. 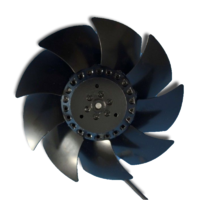 Adjustable ventilation via the internal plenum allows effective air distribution to suit your required application. Enabling you to cool, heat and dehumidify the air the freshjet range will look after you all year round. Ambient L.E.D lighting is also integrated throughout the internal plenum creating mood lighting for every desired mood, all functionalities are easily managed via a remote control. 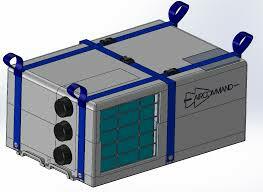 Dometic has also been at the for front of innovation and technology working alongside the likes of NASA to accommodate their need for a cooling system on their Lunar Electric Rover to keep their scientists and their equipment cool and dry in the extremities of extra-terrestrial duties.